Most of the people are confused about the difference between Bison and Buffalo. Generally they think that both are same and there is no difference between them. But, these both animals are different. Buffaloes are found in South Asia and Africa whereas Bison are found in North and south America. ( Mostly in North America). 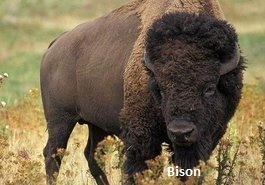 In America, most of the people call a bison as a buffalo. Buffaloes are also come from the same family of the bison but they are different in some characteristical and residential behavior. 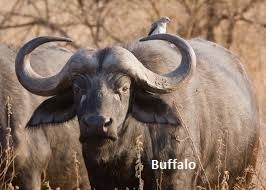 There are two main species of buffaloes. The cape buffalo is found in the sub-Saharan plains of Africa.The second species, domestic Asian water buffalo is found also in North Africa and South Europe along with Asia. 1) Shape: It is a four footed animal with a huge structure and a large hump on its shoulder. It is also a large, four footed animal with a huge structure but there is no hump on its shoulder. 2) Appearance: The bison have small but very sharp horns. They wear a very thick fur on their shoulder and upper body. They have thick beard. The water buffalo has long horns but they are not as sharp as bison. While, Cape buffaloes have the sharp horns of medium length. They have a very light fur on their body. The American bison are generally lower in weight. Their weight can range from 400 to 900 kg. The wild water buffalo are larger and heavier than domestic buffalo. Their weight can range from 700 to 1200 kg. 5) Diet and Habitat: They live on gross and hay. They generally eat grass. 6) Useful for: The bisons are used for meat, clothing, shelter, and weapons etc. The water buffaloes are the domestic pet animals and used for milk, cattle, meat etc. While the cape buffaloes are used as a meat source for hunters and other animals. 7) Used as domestic pets: No Only Water buffaloes are used as domestic pets. 8) Population: Appr. 2 millions. Appr. 150 million water buffaloes and 160000 cape buffaloes. 9) Habitat: Bison are generally lived in plains, rugged lands and cold places. The water buffaloes can't live in rugged and cold places. The cape buffaloes mostly live in rugged condition. 1) Family: The bison are come from Bovidae family. The buffaloes are also come from Bovidae family. 2) Order: Both are come from the same order named"Artiodactyla". Both are come from the same order"Artiodactyla".